Textile reinforced concrete (TRC) elements have so far only been used as flat panels, flat sandwich structures or simply curved building structures. 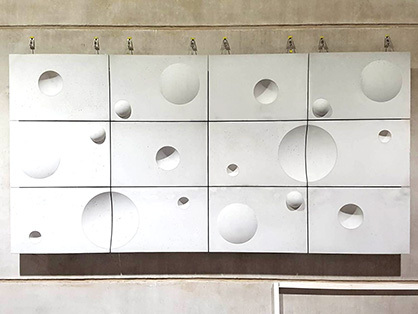 As part of the research project "CurveTex - Development of a drapable textile reinforcement for the production of double-curved textile reinforced concrete elements", the world's first double-curved TRC facade was realised. The successful cooperation took place from September 2016 to August 2018 between the Institut für Textiltechnik of RWTH Aachen University, short ITA, and the two small and medium-sized enterprises (SME) Penn Textile Solutions and Stanecker Betonfertigteilwerk GmbH. The project objectives were the development of a drapable textile reinforcement for a concrete matrix and the production process (concrete casting process) for double-curved TRC elements with continuous fibre reinforcement. Based on the expertise of Penn Textile Solutions GmbH in the production and development of elastic textiles, a new product approach for the development of a drapable reinforcement textile could be used in this project. A textile product was developed which is now used as a reinforcement structure for double-curved TRC elements. Drapable, elastically adapted textile reinforcements were manufactured and tested for drapability and material quality. The manufacturing technique of double-curved concrete elements, developed by Stanecker ensures that the textile product is used as an innovative reinforcement structure in concrete components. This is of particular importance from the architectural point of view, since an increased design variety of textile concrete products can lead to a higher market relevance and acceptance. As a research institute, ITA has carried out material tests, evaluations and coating trials and successfully used the expertise in the field of textile concrete as a bridge between the two industrial partners. The result of the project was a demonstrator facade made of 12 filigree TRC facade elements. The facade with the dimensions 4.83 metre x 2.42 metre x 0.03 metre was constructed at Stanecker Betonfertigteilwerk GmbH and thus made accessible to potential customers. Due to their corrosion resistance, textile reinforcements in concrete components allow a filigree construction. By replacing the steel reinforcements with textile grid structures, up to 80 percent savings in concrete and cement can be achieved, resulting in an immense reduction in carbon dioxide emissions. The geometric formability or drapability of the market-relevant standard textiles has so far been very limited due to the textile grid structure. These standard textiles could not be used for the production of double-curved textile concrete elements, as either undesired wrinkling occurred or the fibres had to be cut through. In both cases, the forces occurring under load cannot be absorbed by the reinforcement. Research within the CurveTex project has resulted in a high geometric freedom of design without wrinkling. 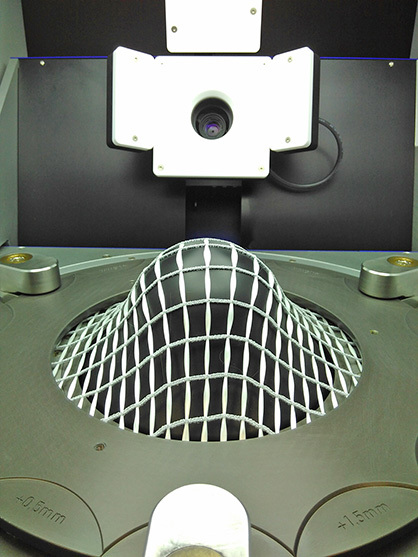 The relevance of this research topic is not only limited to the project partners involved and the construction sector, but also affects several textile-based sectors, such as the automotive industry, since the draping of conventional, two dimensional, textile semi-finished products in three-dimensional, near-net-shape preforms often leads to creases or draping errors. By means of elastically adapted textiles, an improved forming suitable for textiles and drapery can be achieved in every direction. The research results can therefore also provide an impetus for innovation in other sectors. We would like to thank the Federal Ministry of Economics and Energy for funding the research project as part of the Central Innovation Programme for SMEs.